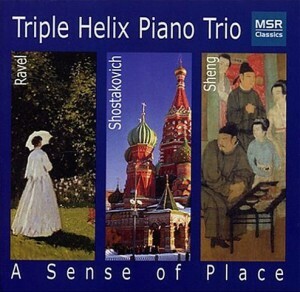 Review by Donald Rosenberg—The Triple Helix Piano Trio, in residence at Wellesley College, in Massachusetts, reveals first-rate artistry here in three works that are vastly different in emotive and stylistic contour. Indeed, the players provide each score with an individual ‘sense of place,’ as their programme aptly proclaims. Mystery abounds in the group’s performance of Ravel’s Trio in A minor, whose Gallic sensuousness and juxtaposition of restraint and flair they define to luminously vivid effect. Violinist Bayla Keyes sends details high into orbit from the slenderest of sounds to gestures that verge on the explosive. Yet she and her colleagues sacrifice neither beauty of tone nor precise ensemble as they explore the poetic and animated Ravellian corners. From the translucent, the ensemble moves like a jolt to the desolate and defiant aura of Shostakovich’s wartime trio (Trio No. 2 in E minor, Op. 67). Triple Helix pays keen attention to the work’s expressive contrasts, emphasizing the penetrating darkness that hovers over much of the narrative and showing no fear in digging vehemently into the grotesque aspects of the klezmer-tinged finale, with ironic wrong notes utterly devoid of humorous nuance.